Delicious, easy One Pot Chicken and Rice to please everyone! 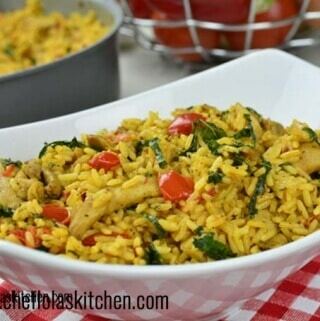 This simple combination of chicken and rice in just one pot is chicken so satisfying. It's basically a full meal in one pot. It's Budget friendly and family friendly plus it comes together pretty quickly in about 45 minutes. Season with Salt, Paprika Curry Powder Garlic powder and Black Pepper. Mix well and set aside. In a large pan, preheat the Olive Oil, once it's hot, add the seasoned Chicken and fry for about 5 to 8 minutes on a medium to high heat. Dice the Tomatoes, Red Bell Peppers, and Onions. Then slice the Kale leaves and set aside. Wash the Chicken Thighs and pat it dry with a paper towel. Season with the Curry powder, Paprika, Garlic powder, black pepper, salt, and thyme. Stir in the Rice, add the Chicken stock and leave to cook for about 15 minutes. Turn off the heat and stir in the Kale leaves. Cover it up so that the heat from the rice can steam up the kale.